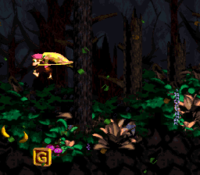 Gusty Glade is the twenty-fifth level in Donkey Kong Country 2: Diddy's Kong Quest and the third area of Gloomy Gulch. It takes place in the spooky woods and prominently features strong gusts of wind. The strong gusts of wind are the main feature and challenge of Gusty Glade. The wind storm is powerful enough to propel the Kongs in the direction it blows, either left or right. Blowing leaves appear on-screen and are used for observing the wind speed. The wind stops blowing in parts of the level, which is when the leaves fall down casually. A light windstorm sometimes occurs, which does not affect Diddy and Dixie Kong but may indicate a forthcoming windstorm. Gusty Glade also features abysses, which is usually where a windstorm suddenly reoccurs at. This is somewhat advantageous for the Kongs to cross wide gaps, however the wind direction can change and likely blow them at a nearby Zinger or down the pit. They must sometimes fight the wind gust to jump over Kannonballs fired from a Kannon. Dixie's Helicopter Twirl is somewhat capable of countering the wind. Gusty Glade features a few Barrel Cannon segments which usually require them to blast out in accordance with the wind direction. The only exception is the final set of four Barrel Cannons, which are grouped together more closely. The Kongs must only blast during the intervals in which the wind ceases to blow. The Kongs can optionally ride on Rattly through the level. They can reach its Animal Crate by using Team-up to reach an area hidden behind the level entrance. Rattly helps them defeat enemies along the path, and is required for reaching a Bonus Level. However, about halfway through Gusty Glade, there is a No Animal Sign, which Rattly is incapable of crossing. The Kongs collect Rattly behind the level entrance. Diddy and Dixie begin the level in front of a tall, steep hill. They can optionally continue or open the Rattly Crate above the hill. A straight pathway with a pair of Klampons on it is to the right of the tall hill. Once the enemies are passed, a strong wind begins to blow the heroes towards a large alcove with a Click-Clack in it. There is a DK Barrel above this alcove. Some stair-like structures follow with a few more Klampons marching down them. A second gap is present after the last stair, and a Banana Coin floats within it. On the other side of the gap, the Kongs can find a pathway that winds around a raised piece of land with two Spinies and a treasure chest, containing the letter K, on it. Another large abyss is ahead, but it can be crossed if the heroes ride on the hard gusts of wind. A gap much wider follows, and dozens of thin, pillar-like platforms are in it. Most of these platforms hold a Neek or a Klampon, but two of them carry the letter O and a DK Barrel. After the final pillar, the Kongs approach another large gap that they can cross with the wind's help. There are some stair-like structures on the opposite side of the abyss, and Klampons and Spinies walk along them. Another abyss is ahead, and this time, the wind cannot help the Kongs cross it, as a high platform must be reached. However, a hook floats in the center of the gap to assist the heroes in crossing. After they pass the gap, they can find a pathway leading to another gap. A small hill with a No Animal Sign is on the pathway, and Rattly disappears when it is passed, if he had been found previously. An Auto Fire Barrel with the Star Barrel above it is above the gap mentioned previously. Dixie hovers over the letter G.
This barrel immediately blasts the primates onto a solid piece of land on the other side of the gap, where a Kannon is present. A wide alcove is ahead with a Kutlass in it. The Kongs' path is blocked by a high wall near here. However, they can climb to the top of the wall, which has a DK Barrel on it, with the use of a hook hanging in the air. Two Kutlass enemies are on the other side of the wall, and one of them can be found on a raised piece of land with a treasure chest, containing a kannonball, on it. Another treasure chest that contains the letter N is under this piece of land. Three gaps are farther ahead. The Kongs must be cautious of a pair of Zingers as they cross the first gap. The second gap, which a simple jump can help them cross, is followed by a small platform holding a kannon. The third abyss is very wide, and not even the wind can blow the heroes all the way across. Luckily, hooks float above the gap that they can use to pass it. The wind blows as they use the hooks to their advantage, and it can push them in the wrong direction as they hold onto the objects. Once the primates overcome the large abyss, they can reach large area of land with a gap in the center of it. A raised piece of land is behind the gap that can be used to cross it. As the Kongs walk along it, a Kannon shoots at them. A DK Barrel wobbles on the section of ground below the enemy. Three Barrel Cannons are present in a wide abyss ahead. The barrels, placed in a upward position, must be used to guide the primates over the abyss. When they blast the heroes into the air, they are sent upwards, so they must shift to the right after exiting the barrels to land in the following cannon. However, the wind can blow them in the wrong direction if they shoot at the wrong time. When the Kongs finally pass the abyss, they find themselves on a tall hill with a Kannon on the bottom of it. A wide gap with a DK Coin above it is near the foe. The wind can help the heroes cross the abyss and land on a platform with another abyss right after it. The letter G is in this gap, which can be passed with the aid of the wind. An even wider pit follows. This time, the wind is an inconvenience to the Kongs, and they must use Barrel Cannons to cross. As they blast out of the barrels, which, as before, shoot them upwards, the wind pushes them around. They must wait for the correct time to shoot so that the wind puts them in the right place. A Zinger is on the other side of the abyss next to the End of Level Target, whose prizes include a Banana Bunch, Banana Bunch Coin, or a red Extra Life Balloon. The Kongs can win a prize from it before leaving the level if they blast down from the last Barrel Cannon. Just before the No Animal Sign are two Bananas that lead up to a Bonus Barrel. They Kongs can enter it with Rattly or by using Team-up. Their objective is to cross a large gap by bouncing on Flitters, and reach the end Kremkoin. The Bonus Area has a time limit of 10 seconds. If the Kongs hit an enemy or fall down the pit, they lose at the mini-game. A light gust also blows in the Bonus Area, and if Rattly enters with the Kongs, his high bounces allows them to cross the gap more quickly. Shortly after the Star Barrel, the Kongs can find two Kutlass, each with a Chest. The Kongs must pick up the upper Chest on the hill and ram it into either Kutlass, revealing the Kannonball. Diddy and Dixie must carefully carry it across two gaps, the first one is patrolled by two Zingers, then throw it into a Kannon. This blasts them into the Bonus Area. 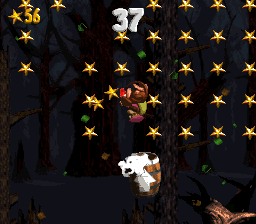 The Kongs' objective is to collect 65 stars under 40 seconds by blasting from an Arrow Barrel, and collect the resulting Kremkoin. There are no pitfalls, so if the Kongs miss the Arrow Barrel, they fall back on the ground. Each side has a stair that returns them to the Arrow Barrel. The Kongs lose at the challenge if they do not collect every star on time. DK Coin Right after the last Kannon is an abyss, and the DK Coin is floating high above in the center. It cannot be reached from a normal jump, so the Kongs can either bounce off the Barrels fired by a nearby Kannon or Dixie can use her Ponytail Whirl move to reach the DK Coin just before the gap. Golden Feather (GBA version) At the very end, just after the End of Level Target, the Kongs must try to climb up the level exit. By jumping, this reveals a hidden hook, allowing them to jump at the top of the structure where the Golden Feather is. 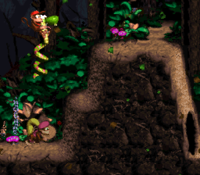 Photograph (GBA version) At the very start, the Kongs must use Team-up to go behind the level entrance. Aside from a Rattly Crate, there is also a photograph leaning against the leftmost wall. It is high up, so the Kongs can only reach it by using Team-up or by jumping at it while riding Rattly. The photograph depicts Rattly, and is stored on page 12 of the Scrapbook. In a Chest guarded by two Spinies. On the last platform of a series of small ones guarded by Neeks and Klampons. Shortly after the Star Barrel, there are two Chests, each guarded by a Kutlass. The bottom one has the letter 'N'. In an abyss just after the DK Coin, following after two Bananas. The Kongs jump between hooks. The Kongs and Rattly sit below the first Bonus Barrel. Diddy carries a Kannonball over a pit. Diddy jumps over a Kannonball fired by a Kannon. The Kongs can reach the DK Coin by bouncing off the barrel fired by Kannon. Location of the Rattly Crate and photograph. Diddy and Dixie cross a series of small platforms with Rattly. 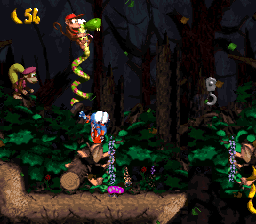 The Kongs use hooks to cross over a pit. 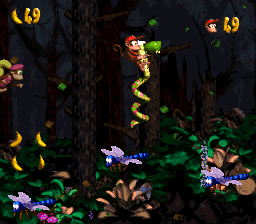 The Kongs and Rattly in the first Bonus Area. The Kongs use Barrel Cannons to cross the wide gap. The Kongs stand near a pit guarded by Zingers. The Kongs are at the letter G.
The level Ripcurl Reef in the Game Boy Advance remake of Donkey Kong Country 3 features strong water currents, like how Gusty Glade has strong wind gusts. This page was last edited on April 6, 2019, at 02:36.